This holiday season, there's an easy way to cut out a lot of stress - let us do all of your baking! We'll handle the muss and the fuss, while you relax and enjoy your time with friends and family. We have the favorites you're familiar with: Smiley Cookies (both regular and mini) and a wide variety of fruit and créme pies - whatever suits your fancy! But maybe you didn't realize that you can also get homemade breads, rolls, buns, and biscuits. Do any of your guests have Celiac disease? Pick up a half-dozen of our gluten-free buns! Whatever you need to complete your holiday meal, you can find it at Eat'n Park. And don't forget that our delicious Pumpkin Pie is on sale during the month of November for just $7.99 for a whole pie! Or try our new Pumpkin Créme Pie - it's sure to wow your holiday guests! 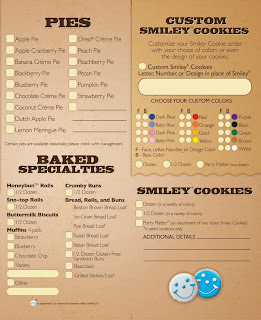 Click here to download our bakery order form. Need the number for your local Eat'n Park? Click here. Warm Up With Two Great Coupons at Eat’n Park!